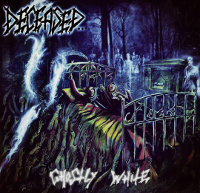 Ghostly White is the new Deceased record, set for release on November 16, 2018. Before we get into reviewing it, news of the record is mixed with a tragic loss: bandleader King Fowley posted on his Facebook page that drummer Dave Castillo passed away in El Salvador on November 12. Ghostly White is the first studio album of new material that Fowley, longtime members Mike Smith and Les Snyder, and Castillo played on together since As The Weird Travel On in 2005. Guitarist Shane Fuegel joined the band in 2006, and he posted a tribute to Castillo. Deceased’s motto is “death metal from the grave” but Ghostly White has a strong and intentional heavy metal influence too. Maybe a return to form, maybe a return to the roots, the record is an excellent addition to the band’s discography. Fuegel had previously told D.U. that he is biased, of course, but he thinks Ghostly White is among the best Deceased records. The record is a vast improvement over the last album, Surreal Overdose, and picks back up where As The Weird Travel On or the record previous to that, Supernatural Addiction, left off. This is a good thing. While it has its shredders, like “A Palpation’s Warning,” there’s plenty of guitar melody and proper death-metal-mixed-with-heavy-metal riffing. “Germ Of Distorted Lore” (up for listening on Bandcamp) is an epic 13-minute song, but most of the rest of the tracks are in the 5-to-7-minute range. Vocalist Fowley’s unique style and way of arranging his lyrics is in full effect. Deceased recorded Ghostly White at Mike Bossier’s Oblivion Studios. He engineered the record and co-mixed and co-mastered with Fowley. “It’s a really good record, man. I’m really proud of it, and I think people are going to dig it,” Bossier previously told D.U. 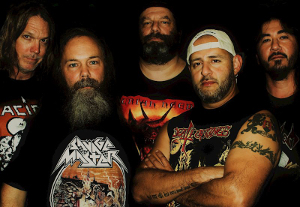 Fowley, who produced Ghostly White, “just wanted an old-school-sounding heavy metal record, and I really think we achieved that,” Bossier said. Ghostly White is up for pre-order on CD and on cassette at Hells Headbangers. This entry was posted in Reviews and tagged death metal, Deceased, heavy metal, Hells Headbangers by Editor. Bookmark the permalink.